Leather repair Doncaster, you have found us! Your local specialists in all forms of leather repair and renovation. We can deal with anything from cat scratches to deep cuts and scuffs on anything from your leather sofa to your leather jacket. Leather repair Doncaster uses the very latest technology and the best materials available. This ensures that our leather repairs will last longer and make your leather sofa, jacket or car seats look fantastic now. And into the future. Why settle for anything less. Get it done by a local family firm specialising in leather repairs Doncaster. We are your local, highly trained professional leather repair experts. It’s a fact that people will pay thousands of pounds on a nice new leather sofa. Have it for just a few years and because of an arm is looking tatty by cat scratches. Or a cut that someone has done with something sticking out of their pocket. They are prepared to throw it away! This seems like madness to us. We can repair that for you. Our training and experience makes it possible to make a leather repair that will last and will look great. We are not an out of town franchise that depends on charging high prices to pay for advertising, franchise fees and management staff. You get us every time and our personal guarantee of quality and satisfaction. Apart from the environmental impact, just look at the money that will be spent on new leather upholstery. Probably as much as a good summer holiday for the family. It’s a waste of family resources and besides, you are probably comfortable in that leather chair by now. We can bring it back to life for you. Don’t throw it away! It does not have to be that way. We can come out and give you a quote for your leather repair work and if you like, we can sort it out for you. We will analyze your leather under the microscope to understand exactly what type of leather it is and what has been used to colour it and we will explain what can and can’t be done. It’s all free by the way. And we do it all in your home. So forget worrying about moving it. In addition, the very least you will know after our free quote is what sort of leather you have so that you can buy the correct leather cleaners and conditioners. Because using the wrong type can seriously damage your sofa even more. When you go to a furniture shop to buy a new leather sofa. You will most likely be offered a leather repair kit, as if they are giving you the world after paying £1000’s for the sofa. This is usually not a lot of use. And excessive use can just take the pigment out of your new furnishings. And change the colour. This will start to show the under coat that the furniture manufactures apply before applying the finished colour pigment. Then you are down to the bare leather in no time. So just to give you a quick idea of how how your leather furniture is made. It starts in most cases with a cow. This is pretty obvious, but it can come from any animal from crocodile to goats. let’s say it comes for a cow for now. It is a by product of the meat industry. So using the leather for furniture, jackets shows etc actually helps reduce the amount of plastics we use. This can only be a good thing in my opinion. But, that’s just me. The skin, or hide as it is called in the leather industry goes though a long process in the tannery. I will write another article about this and link this to is, when I have time! After this, it is either sold as a tanned hide, or it is further treated by professionals and ends up coloured. This is then used to cover furniture or to make some other leather product, like leather car seats. Usually, it is coloured again and then special protective coats are applied. This is left to cure. It is this protective coat that is so important for your furnishings. When we get on and off of the sofa or chair. Which can be hundreds of times a week. We rub this leather protector off. Don’t worry, it is designed to do that. If it was permanent. Your sofa would not be flexible. It would be like sitting on cardboard. Re protecting your leather sofa is essential if you want to keep it looking great and if you want it to last. It will crack and deteriorate if the leather is not deep cleaned after repair. Teated with restoration products and then re finished with coats of leather protector. This is a fairly quick service that we offer in addition to leather repair. The protective coating is designed to wear out instead of the leather pigment (colour). The trick is to replace the protective coating before it wears through to the pigment (paint). This usually takes us around two hours in your home. It’s not messy and the results are stunning. We are a local family firm and we only cover Doncaster and the surrounding area. 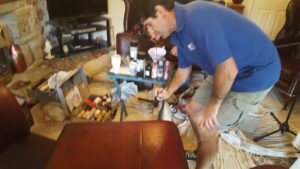 Highly trained in leather repair techniques by some of the best in the industry. So you can rest assured that you are in great hands. And that you will have a first class job that will last. We guarantee all of our work, so no worries there. We can attend to a few cat scratches or completely re colour your furniture with our top quality British made products. All leather items are treatable. So if you have a jacket, a handbag, or any sort of leather that you want to look great again. Just call us today for a free quote. Whether it’s leather repair or a deep down clean and re protect. We will give you the very best service in Doncaster.